NET LEASE 98 • SHOPPING CENTER BUSINESS • May 2018 C ommercial real estate investors navigating today's market are con- fronting a number of economic and policy variables that did not exist a mere six months ago. Tax reform and recent job gains have buoyed optimism about growth. But higher interest rates, a volatile stock market teetering near all- time highs, and possible tariff policies that could spark a trade war are generating anxiety. The dynamics dented single-tenant net lease investment activity early this year. But brokers fully expect to stay busy, and they do not foresee capitalization rates ris- ing significantly, if at all, especially on core properties and locations. An abundance of private and institutional buyers are still demanding the bond-like properties that house dollar stores, pharmacies, quick service restaurants and other operators, many of which are considered largely re- sistant to the disruption of ecommerce. Meanwhile, net lease tenants that have been hurt by online shopping — namely big box operators — are looking at creative strategies to simultaneously increase traf- fic and trim their footprints [see sidebar on p. 40]. "Deals, especially in top markets, are still trading at very competitive cap rates," says Doug Aronson, a managing director for Herndon, Virginia-based Calkain Companies, which has brokered $12 bil- lion in sales since 2005. "In the past five years, we have seen more and more new investors come to the net lease sector, fueled in part by very low yields on other tradition- ally conservative investments." Indeed, annu- al dividend yields for net lease real estate in- vestment trusts (REITs) provide a glimpse into how much cash the properties are generating for inves- tors. 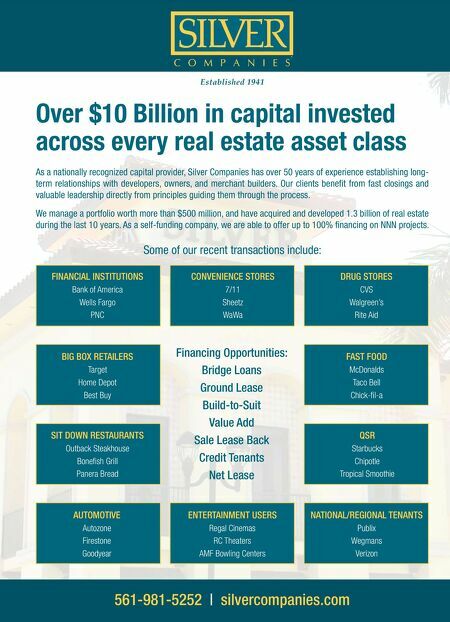 Store Capital REIT (NYSE: STOR), Net Lease Stays Steady Fully priced properties withstanding changing capital environment. Joe Gose In 2017, Marcus & Millichap represented the seller of a 12,350-square-foot Walgreens in West Milford, New Jersey, for $10.6 million. A private investor fulfilling a 1031 exchange acquired the nine-year-old property. Jeffrey Thomas Founder Thomas Co.